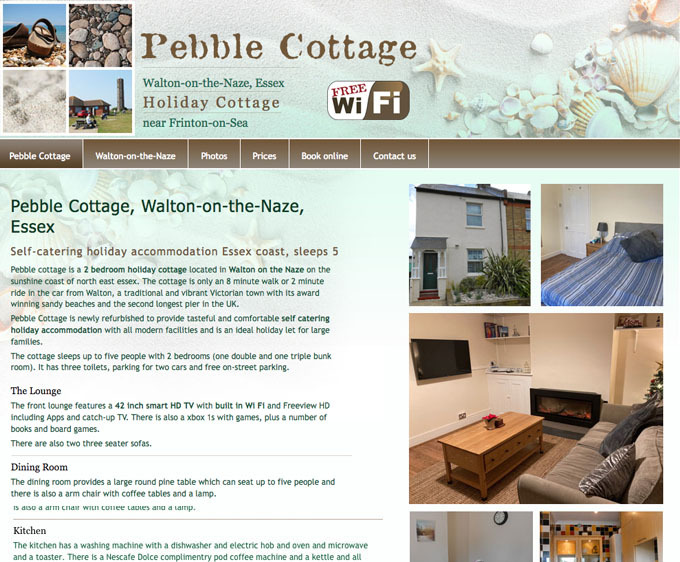 Holiday cottage in the coastal town of Walton-on-the-Naze in Essex offering self catering accommodation for 5-7 people. This was a new website designed and built from scratch for a new business venture. The client owns a lovely holiday cottage in Walton-on-the-Naze and has completely refurbished the property to provide comfortable accommodation with all mod cons and plenty of entertainment extras including table tennis. We created a visual for the new site based on a seaside theme to reflect the name and location of the cottage. The client wanted an online booking system so we integrated the site with the Holiday Bookings Online booking system and customised the booking templates to match the design of the new website. The client sold this business recently but we have since built a new site to promote his gardening business.